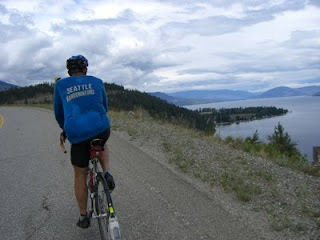 We woke to cloudy skies, unusual for the Canadian Okanogan and knew that some showers were in the forecast. At breakfast, my food seemed to take a long time, until I realized that Doug's sheepish grin was due to Bill's generosity in giving him my plate. Doug is too nice of a guy to have eaten it, luckily, since I was starting to slip into a hypoglycemic coma. I had felt cheated about having to drive the first 20 miles of the Tour, until I saw what I was missing: narrow shoulder on a busy highway, a steep climb and a construction zone with no shoulder. I scored! When I traded off SAG duty to Steve, I caught up with Kent and rode with him for the rest of the day. And it was a good thing, too, because his GPS, Henry, was able to decifer the route that I don't think I would have followed correctly based on the cue sheet. In fact, we watched as Peggy, Tom M and Jay went what looked to be the wrong way. After lunch, I was antsy to leave and so I departed with the tandem of Dottie & Orin. We had a big hill before us, but I figured they would catch up on the downhill. The problem with that theory was that the climbs were many and steep and long and so I was riding on my own for quite a while. Then Tom S and Pete caught up to me and must have been taking it easy because I was able to hang on for more than a moment. After a little bit, I realized I was headed for exhaustion if I didn't slow down so they said they would slow down, too. But my "slow" and their "slow" are distant cousins so I waved to them as they disappeared around the next bend. With 15 miles to go before Armstrong, the terrain mellowed out and I felt like I could relax and enjoy myself. I stopped for cookies and met up with Dottie & Orin and we rode together for the rest of the way. 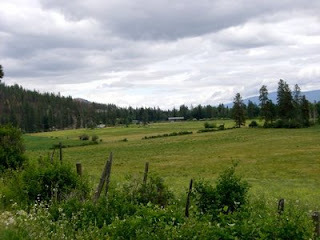 Once we had turned off to a meandering country road and were passing dairy farms, I thought it appropriate to ring my cow bell that I had stashed in my pocket at lunch. The cows responded better that the tandem, surprisingly, as the cows each perked their ears at the faintly familiar noise from somewhere back in their family heritage. 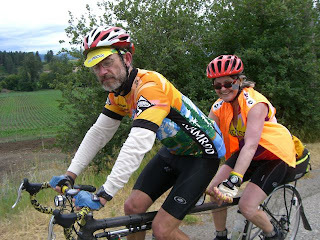 The tandem, however, smirked, then kept on riding. It's always at dinner that the real personalities are revealed. Perhaps we all new of Pete's prowess to command the calories of multiple plates at once, but we had no idea that Bill's true Goose name was "HoneyBuns", HB for short. A honey-brewed beer tasted really good after a 90-mile, 5500' gain ride. And I had cherry pie for dessert, though Chris' apple pie looked much more tasty. But, you know what they say about pie...love the one you're with!